I just realized I’ve neglected to post some after treatment images of the first panel, which was completed quite a while ago. We are now finishing up the third of four panels. Here is panel 1. For comparison purposes, here are a couple “Before” views of the lower part. Although the quality of these images is not great, I’m happy to say that we’ve since upgraded to a DSLR camera and improved the photography setup (following the AIC Guide to Digial Photography and Conservation Documentation, 2nd edition), so future images should be much better! It’s been a while since the last post. We have been busy with multiple projects and there’s been little time to pause and reflect on the treatment of the leather panels. In the meantime, some progress has certainly been made. Consolidation and reinforcement of the trim is complete, and we have now turned our attention to the main structural damage, namely the large tears near the bottom of the panel. All that stabilization was essential before we could safely turn the panel face down to begin the next phase of treatment. 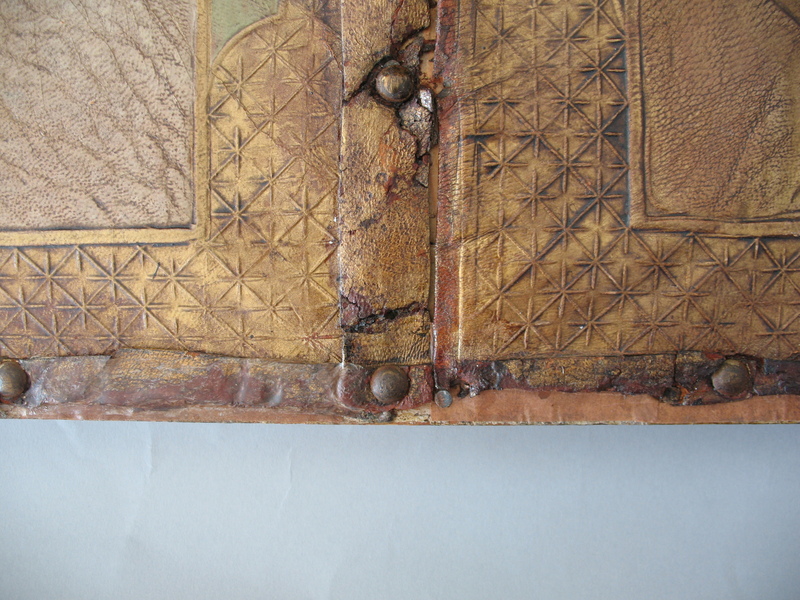 As I mentioned earlier, the area of damage was consolidated with Pliantex solution from the reverse. (Due to both the limited budget and to minimize the extent of damage, the old paper backing was removed locally around the tears/splits, rather than overall.) For additional strength–so that the leather is sound enough to withstand having something adhered to it–we also applied a dilute solution of BEVA 371 in the areas immediately surrounding the tears to be mended. The repair will consist of lining the tears and areas of separation with narrow strips of Hollytex/BEVA film on the reverse. Then the old canvas backing we temporarily removed to gain access will be reattached to maintain uniformity in the structure of the layers. From the front, the losses and gaps will be filled with BEVA Gesso mixed with powdered pigments to more closely resemble the color of the leather, plus glass microballons to make the fill lighter/ less dense. 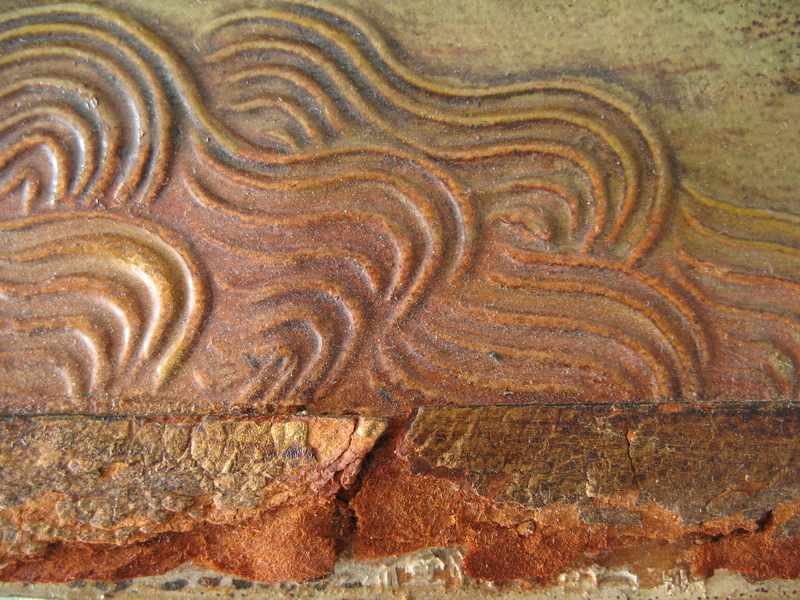 Some final toning of the fills as well as the Goldbeather’s skin used for reinforcing the edges may also be necessary to reintegrate the surface appearance. Then we will add a rigid backing made of several layers of acid-free corrugated board laminated cross-wise, over a cushioning layer of dense polyester batting. This backing is the most important measure in protecting the panel from future damage. But that’s not quite the end…we will move on to the other three panels in the group. Undoubtedly, this will be a year-long project at the very least. Somehow, I would really like this blog thing much more if it were a dialogue wherein ideas could be shared. 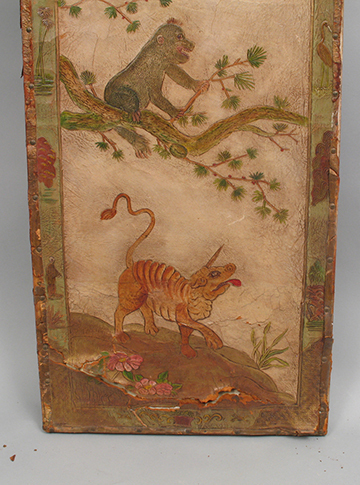 I am very open to other ways of thinking and approaching the conservation of leather, so I would love to hear what techniques and adhesives others are using. Do you consolidate to strengthen the surfaces prior to mending? What are your preferred adhesives and loss compensation materials (other than BEVA)? Any comments or feedback you’re willing to share would certainly be appreciated! 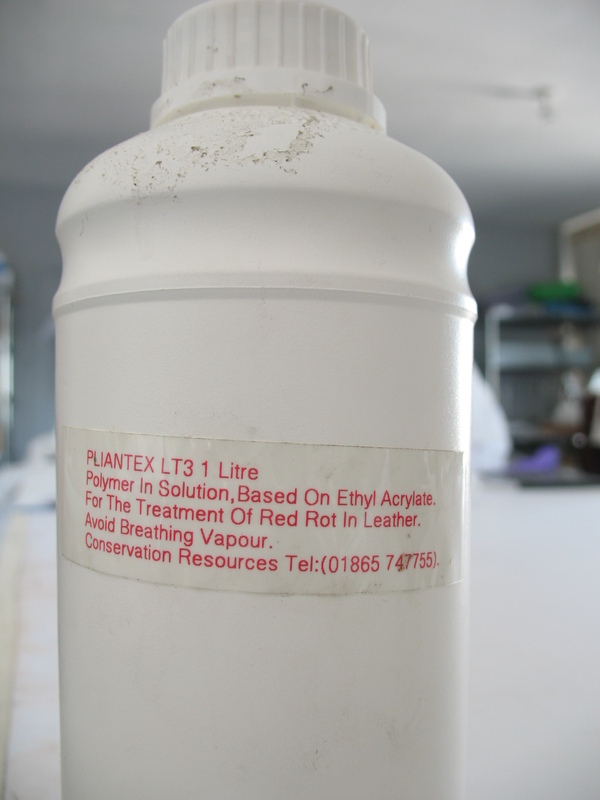 Developing a treatment plan: The main challenge has been finding the right consolidant, one that will improve the leather’s strength so subsequent repairs will hold. I have plenty of experience working on leather artifacts, and know what the limited options are when the leather is this degraded. Klucel G works well in the short-term (it has good penetration and effectively consolidates the powdery surface) but is relatively weak, and is known to have a short lifespan of usefulness. What’s more, Klucel is fairly brittle and has shown unsatisfactory long-term ageing characteristics, particularly in an acidic environment such as that encountered with deteriorated leather (e.g. in the presence of sulfuric acid from absorption of sulfur dioxide in the atmosphere). This is a dilemma we all struggle with at some point in our careers as conservators. It is understood that any consolidant introduced into a porous material such as leather, is for all intents and purposes, not reversible. It would be nearly impossible to extract the consolidating agent from the porous material completely. And why would you ever want to, as long the material is stable and is not causing any harm or threatening the future stability of the object in question? There are really only two choices: 1) either to do nothing at all and let the object continue down the path of deterioration and eventually cease to exist, or 2) do something that we’ve been taught to avoid, something that defies our ethical sensibilities—that is, something not readily reversible—and by this intervention, ultimately allow the object to survive for future generations to enjoy. 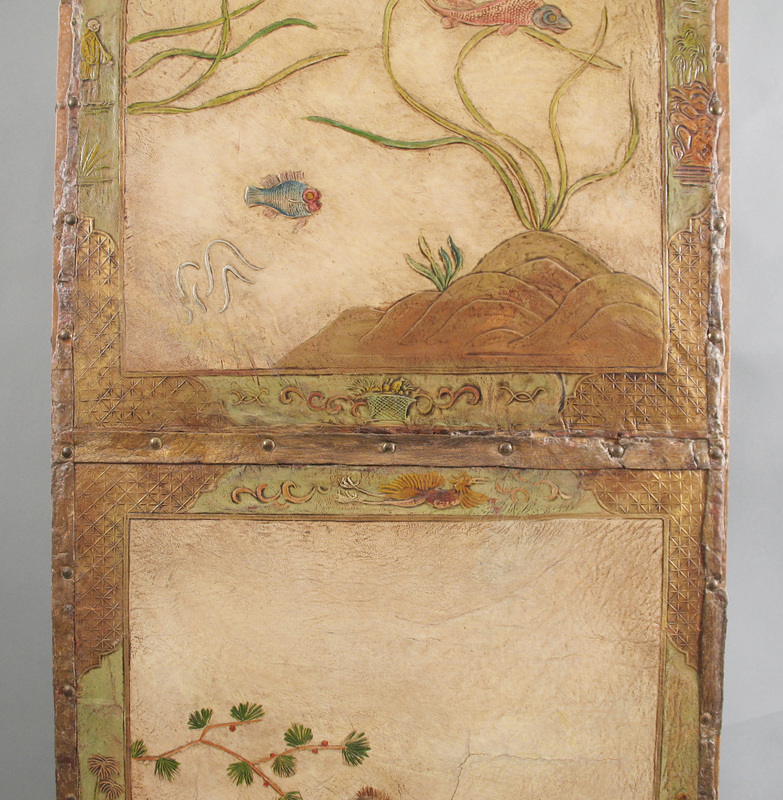 A bit of background on the panels: in another life they formed a screen, but it appears the leather was cut from something originally larger (possibly wall paneling in a room, or an even larger screen). This is suggested by the sharp cut lines along the edges and the fact that part of the painted/embossed border design has been trimmed. The wood frames to which they are now attached appear to be relatively recent. 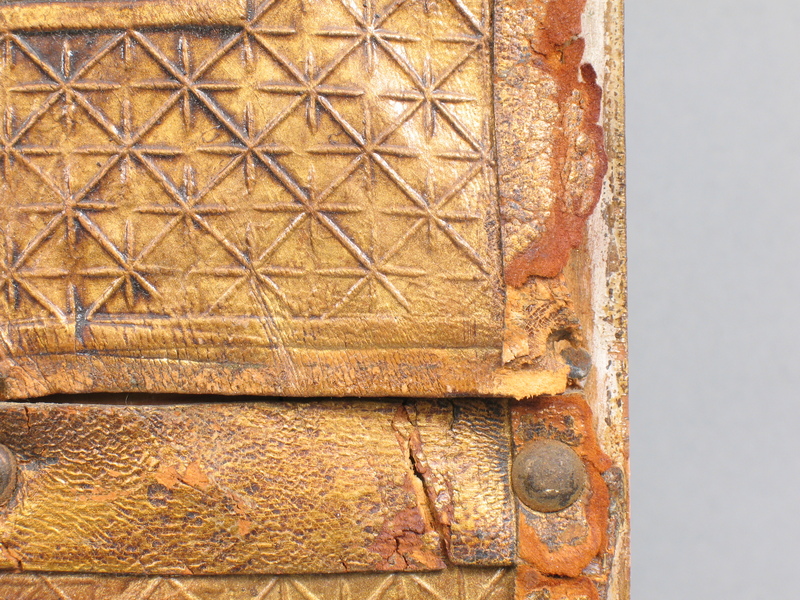 Narrow strips of leather secured with brass nails were added to cover up the cut edges. 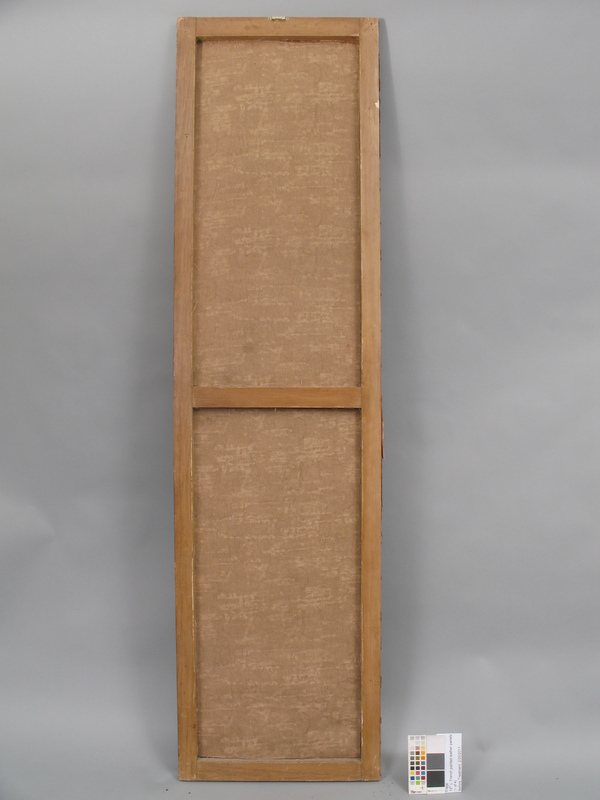 Each of the four panels is comprised of two sections of leather stretched over a wooden frame. 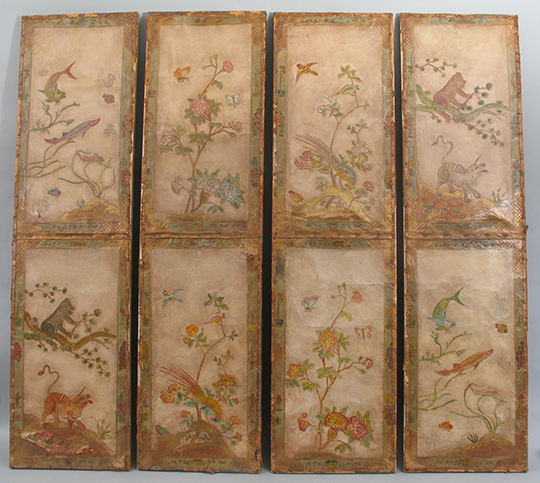 The leather is embossed and painted with floral and animal/bird motifs. 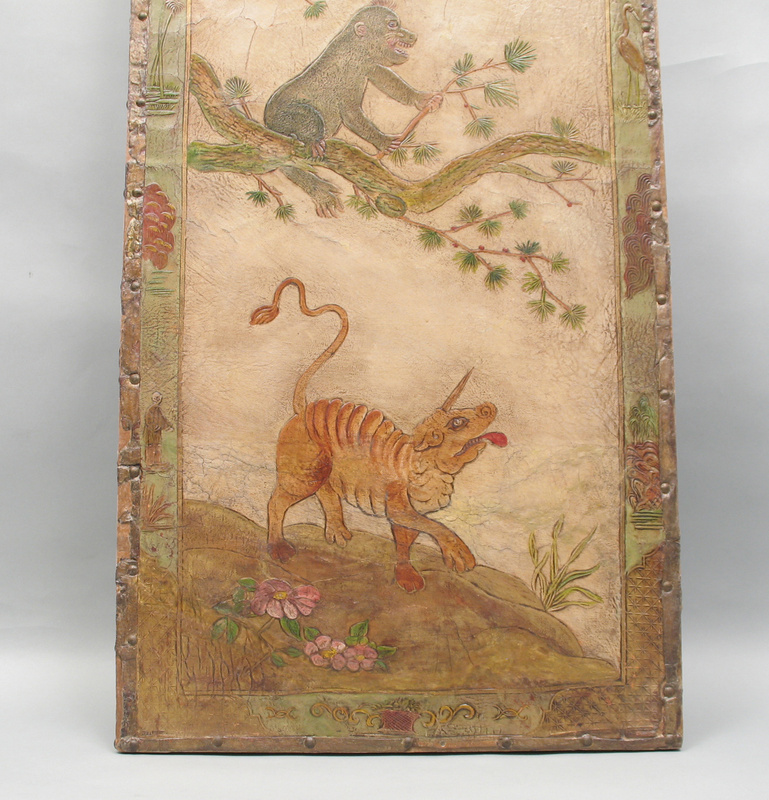 The surface is varnished overall and stained to give the painted background an “antiqued” appearance. 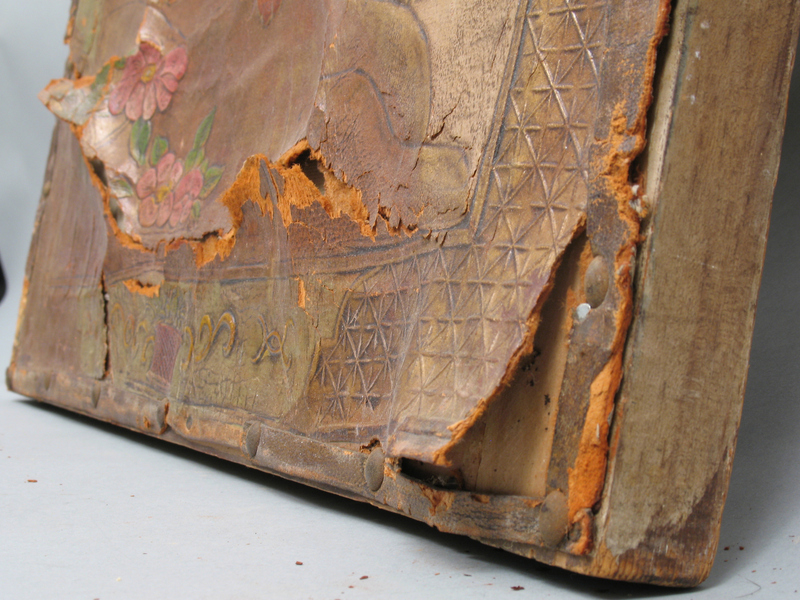 Current condition: The leather is extremely desiccated and brittle, and shows an advanced stage of a type of deterioration known as red rot. The latter includes overall loss of strength, embrittlement, desiccation, and associated cracking, flaking, and powdering of the leather with resulting breakage and loss of fibers—this is particularly apparent in the leather trim along the edges. You can see that the fibers are breaking up and crumbling to dust. The problem, simply stated, is that the leather is disintegrating. 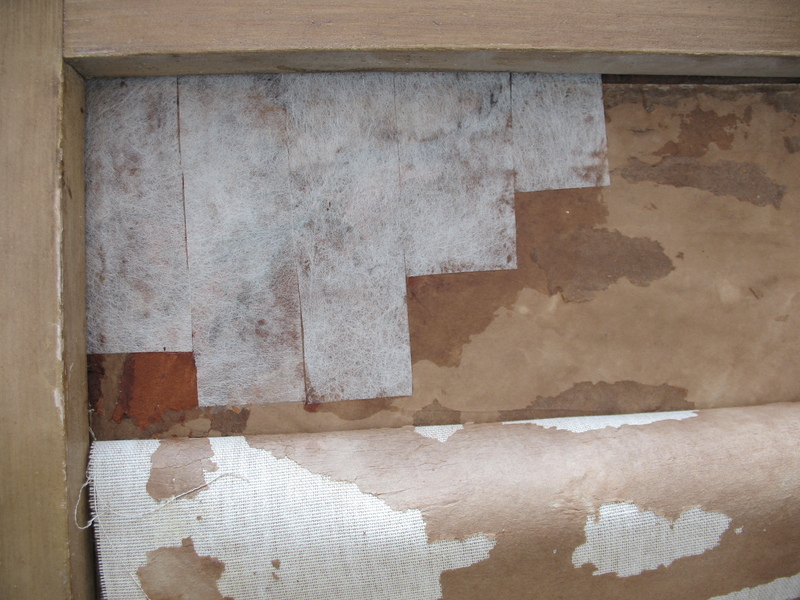 The fibrous structure made up by the collagen protein is literally breaking apart and turning into dust, especially in the trim leather, which is of a different type than the large pictorial areas. The trim is extremely ragged in appearance due to the abundance of losses. 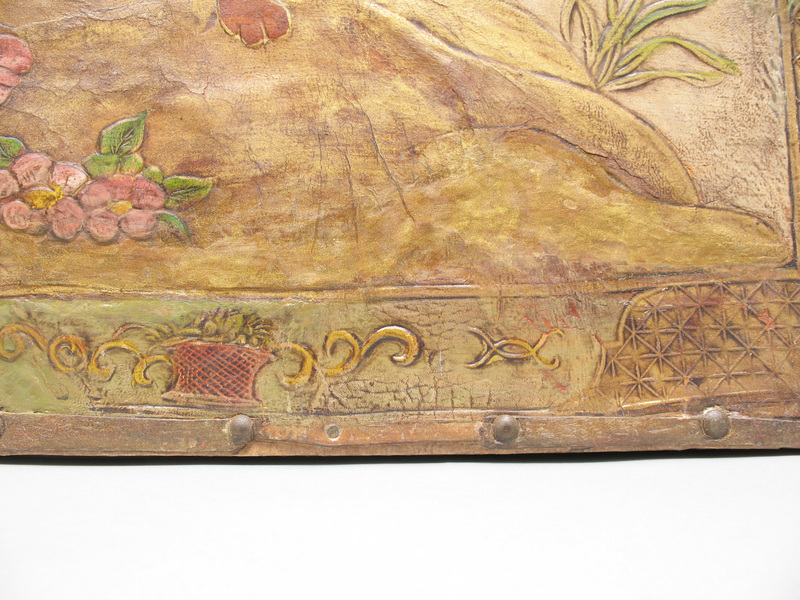 There are a number of tears and splits in the primary decorative leather as well, the worst of which is across the bottom of panel #1 (below). To complicate matters, the varnish on the main leather (but not the trim) is sensitive to many solvents, including alcohols; it is not adversely affected by naphtha or xylene. 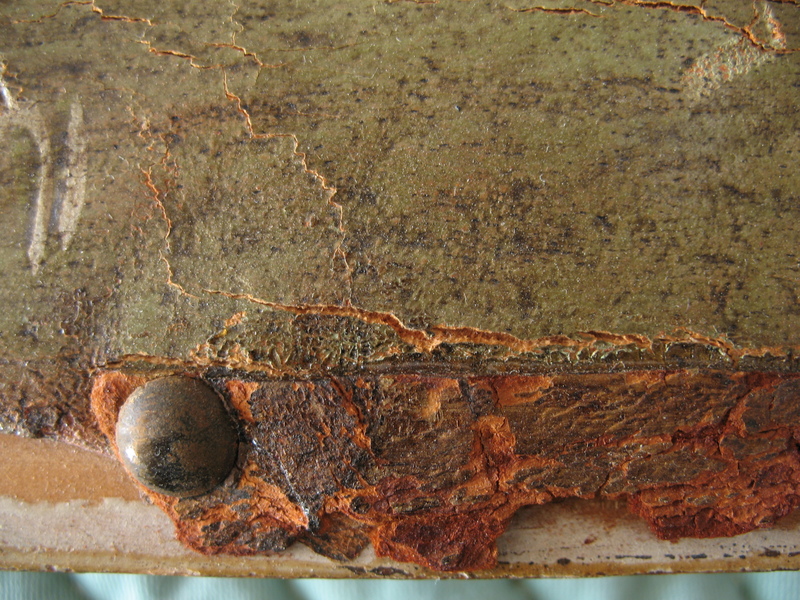 A comprehensive discussion of the mechanisms of leather deterioration can be found in Conservation of Leather and Related Materials by Marion Kite and Roy Thomson. I highly recommend this book for anyone that is working with leather. 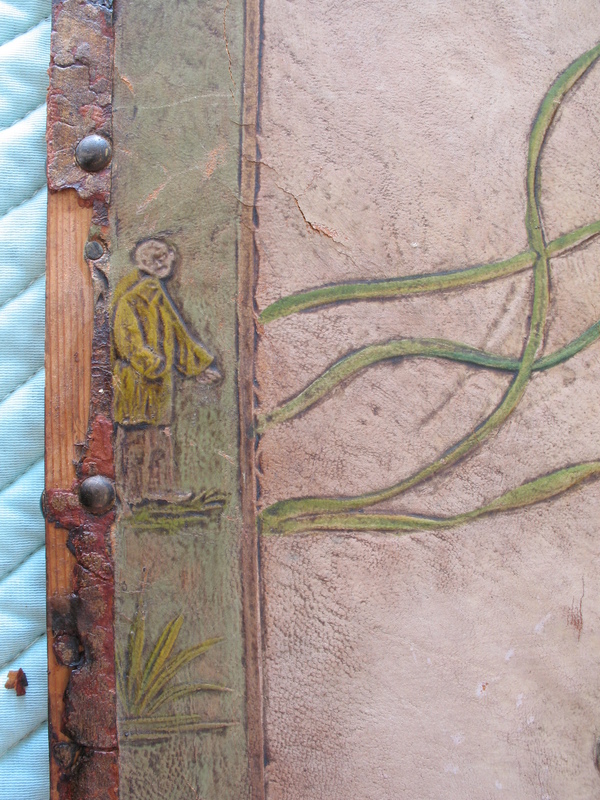 Oh, I should mention that the backs of the panels have been lined with a layer of acidic paper and a heavy woven cotton fabric. Both are adhered with animal glue! Ugh!! Oddly enough, the fabric does not extend all the way to the edges of the frame, and looks as though it was applied after the leather was stretched onto the frame! 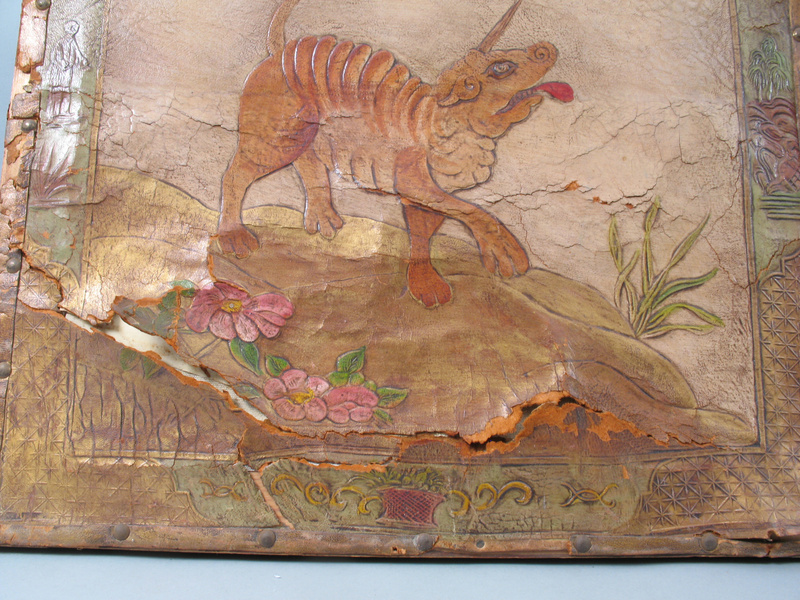 Not a well thought-out solution, and clearly not the work of a professional conservator, nor even that of a skilled restorer. Removing the lining is not really an option because the leather is too weak and the damage this process would likely cause is too great (plus, our dear client has limited funds). Therefore, we will only be removing certain sections, where it’s necessary to gain access to the back for mending tears and splits.